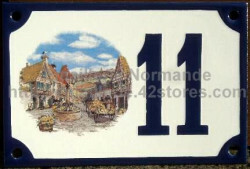 -10x18cm for numbers from 10 to 99. 4 holes to fix it, white backgrond, colour of the border and number can be blue, green or black. Your number has 3 or 4 figures, please see the dedicated page. Writte your number, choose it with or without border, choose the number/border's colour. Coulours shown here may vary from the reality. *Postage fees may be calculated if you put a product in the basket (click on "buy now") and choose the country of delivery in the listing. Use(+/-) to take the product off the basket once you know the postage fees. You face a problem, please contact us.